Our family trip to the mountains was something that I looked forward to every single summer. The summer of 2014 was no different. What was different was that I was not able to hike, kayak, swim, or even hike efficiently with the rest of my family. I was experiencing limited movement and pain from shoulder osteoarthritis that had significantly progressed since my doctor's recommendation for shoulder replacement surgery 2 years earlier. When we initially discussed the surgery, I thought I was too young and wanted to consider something less dramatic. My doctor assured me that it didn't matter that I was only 55 years old, my joint was beyond any other treatment. At this time in my life, I was not at all prepared for this surgery. Then, in March of 2013, my husband was diagnosed with stage four cancer that required extensive treatment. The last thing on my mind was surgery, and I focused my energy on taking care of my husband. Late that fall, my husband went into remission and I was able to go back to the doctor. I scheduled my surgery for early May, but just two weeks before the surgery my husband's cancer came roaring back and I postponed my surgery indefinitely. My amazing husband died on June 1, 2016. We all miss him every day. I had my shoulder replacement surgery in December of 2016. The entire time I was putting off surgery, I was actively learning how to prepare for life before and after the operation. This included pre-surgery exercises, suggested by my PT, Brian Deluca, at home. I also went to community acupuncture with Craig LaBadie whenever I could fit it in. These two measures helped in keeping the tissues as healthy as possible, and the acupuncture also helped me stay somewhat calm during a really stressful time. Yoga was a really big part of my life. I continued to practice yoga daily at home and once or twice a week in a class. I had to develop a yoga practice without bearing weight on my arms. This helped me to stay as balanced as possible and it really helped me keep my spirits up. I also worked with Beth Elkins, an advanced Pilates teacher, to develop a simple daily core series to stay as strong as possible without planks and other core movements that increase shoulder stiffness and pain. 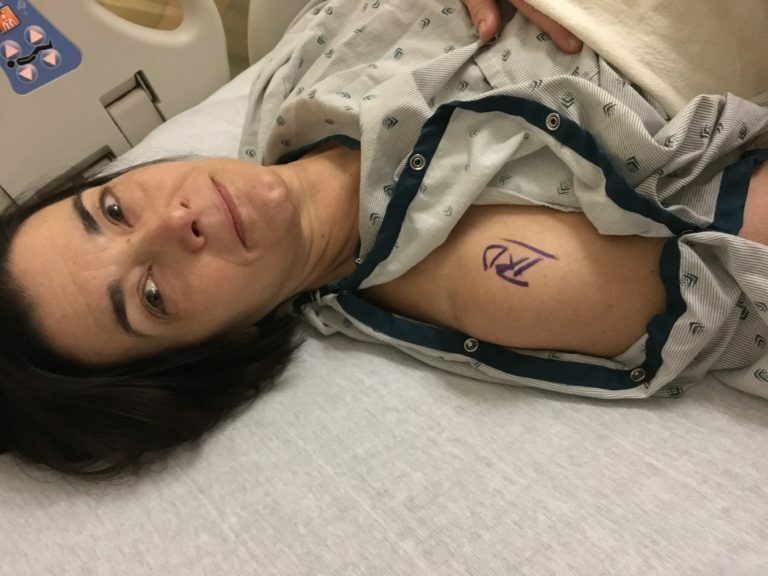 During this time, it was difficult for me to emotionally come to terms with having to have shoulder replacement surgery without emotional support from my husband. His presence was strong as I prepared and I felt him there in spirit in the pre-surgical room and recovery. Our sons, daughter in law, family, and friends (many of whom are my colleagues) and my employer have supported me every step of the way. I am grateful for the amazing privilege I have in terms of healthcare, knowledge, and support. My Occupational Therapy training helped a lot when planning for post-surgery self-care like showering, washing and drying my hair, brushing my teeth, putting on make-up (not much! ), getting dressed, light food prep and housekeeping. 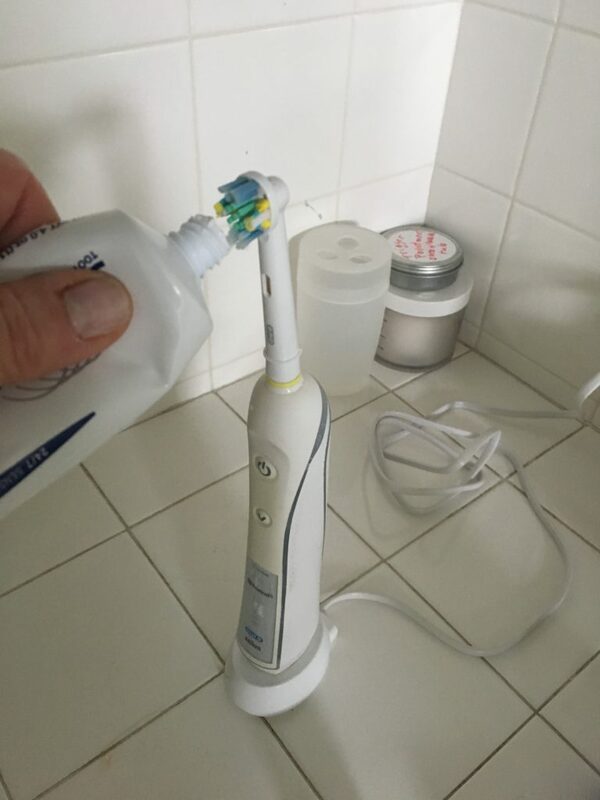 I already had an electric toothbrush, and I just removed the toothpaste top to make it easier to use. I purchased an inexpensive one-handed refillable flossing device and put pump soap in the shower, which already has a seat and shower hose. As directed by the pre-surgery group "class" hosted by the surgical group (big help!) I purchased a couple of inexpensive sweatpants and tank tops a size too big, which made dressing post surgery very easy until I was able to manage more after a couple of weeks. Because I was home I mostly wore tank tops and sweatshirts so I didn't use bras until about 3 weeks post-surgery. When I did I would fasten them in front and slowly work them around and then lean forward and put my titanium arm in first, then the other arm. I also purchased an inexpensive pair of slip on sneakers with good tread to wear in the hospital post surgery and at home after surgery, as tying my shoes was not possible for a few weeks. I find myself using all of the methods above to this day. No matter what your circumstances are, our goal is to offer simple, low-tech and inexpensive ideas that you might use as you go through your experience. « Why Shoulder Replacement Surgery? Disclaimer: This blog provides general information and discussion about medicine, health and related subjects. The words and other content provided in this blog, and in any linked materials, are not intended and should not be construed as medical advice. If the reader or any other person has a medical concern, he or she should consult with an appropriately-licensed physician or other health care worker.